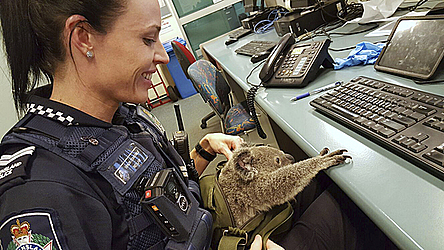 SYDNEY (AP) — Australian police have made an unusual find while searching the bag of a woman who was being arrested: a baby koala. Police in Brisbane said that when they asked the 50-year-old woman if she had anything to declare Sunday night, she handed over a zipped canvas bag that she said contained a baby koala. The woman, who was arrested on "outstanding matters," said she found the male koala on Saturday night and had been caring for it since. The woman was taken to a police station, while the koala — believed to be about 6 months old — was taken to a wildlife hospital in good health, though slightly dehydrated. The baby koala weighs about 1.5 kilograms (3 pounds) and has been named Alfred. "He's been on fluids but is doing well and will shortly be going out to a carer," RSPCA spokesman Michael Beatty said.